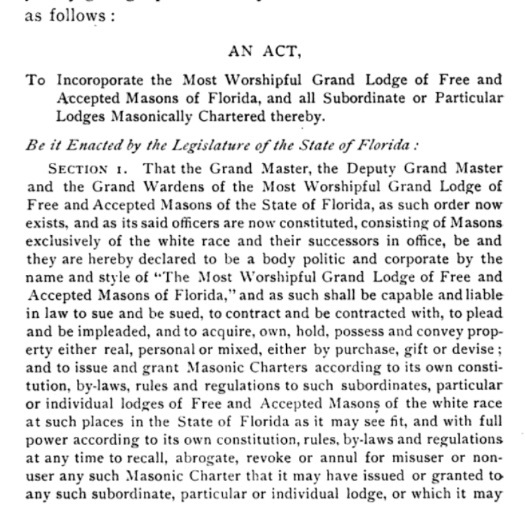 Freemasons For Dummies: Lawsuit: GL of Florida Discovered To Be Incorporated As "Whites Only"
Lawsuit: GL of Florida Discovered To Be Incorporated As "Whites Only"
It was a dark hidden secret in an already secretive fraternity, until now. "It did surprise me," says Hammond. "To me, it runs against the principles of freemasonry where we all are in the brotherhood of man under the fatherhood of God." Apparently, the Grand Master of Florida at the time took offense to the editorial and called Hammond to question him about it. After asking Hammond if the unnamed "incompetent" and "corrupt" "leaders" mentioned in the article referred to him and the Grand Lodge, Hammond glibly replied, "If the shoe fits, wear it." The complete details and exhibits of Walter Hammond's very extensive Masonic record, his original transgression and subsequent printed retraction, his complete Masonic trial proceedings, and attempts by his lodge to have his indefinite suspension lifted over a three year period, are all contained in the legal filing that is now public record in a civil court, and may be found HERE. Hammond was a very active and respected Florida Mason for over 50 years, ultimately serving as a District Deputy Grand Master, and he believes his indefinite suspension that is now approaching 8 years was unfair, especially in light of his original infraction. (I'll leave it to the reader to go through the whole legal file and draw your own conclusion.) His home lodge claimed the right to try Hammond themselves, but were denied. A Grand Lodge Trial Commission was appointed instead by the Grand Master. Many Masons over the years in a wide variety of jurisdictions have complained about the methodology of trial commissions and the capriciousness with which they have sometimes been conducted. Because every grand lodge is sovereign and has their own rules for conducting these trials, they can vary wildly. Some jurisdictions, like Florida, hold that the grand master alone has the right to interpret the meaning of his grand lodge's rules, and these interpretations can change from one year to the next, as the grand master's successor takes over. 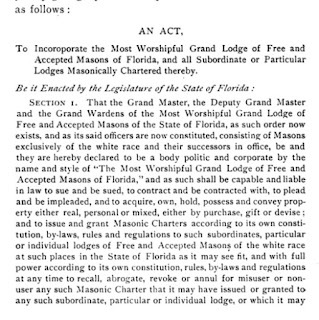 The "Jim Crow" law referred to in the article apparently came to light as Hammond's attorney was researching the Grand Lodge of Florida for his civil trial. Lawyers being lawyers, apparently he wants to now pursue a class action suit against the Grand lodge of Florida (although, just who the damaged class actually would be is unclear, and references to it are not contained in the trial filings online). Civil cases brought by Masons to attempt to overturn the results of Masonic trials rarely succeed in modern memory. Courts usually rely on first following the rules set down by private clubs to redress grievances, and Masonic codes can be extremely arcane. Hammond's long suspension seems unduly harsh, especially in light of what the original offense was in the first place. (His lodge was forbidden to allow him to even come to family and guest night events, under threat of charges.) It seems a terrible injustice to cast out a 50+ year member, a 33°, and a man who served so many Masonic bodies, starting as a DeMolay in his teenaged years, so I wish him well in his endeavor. But this headline-grabbing attempt to enlarge the lawsuit beyond simply seeking reinstatement will do no one any good, and only bring more bad press in a year that hasn't been going well for Masonry already. We should not be surprised that although they have been aware of the white men only clause for many years, they haver not done anything about it. 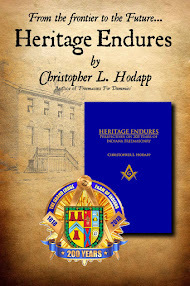 There are so many accounts of the miserable way African Americans are treated by the southern lodges that even an ostrich would have realized how racist masonry in the southern states is, and how the blue lodge discrimination has enabled the York and Scottish rites to cleverly pretend to be multi racial-- "too bad you can't join a regular lodge so you could join us''. So here we are again, certified as anti gay racists and anti semites, over and over, and the grand masters do nothing. It saddens me to hear you generalize all southern lodges. I cannot speak for any other jurisdiction aside from Ohio: here we do not have a problem with race and we have a friendly relationship with our Prince Hall brethren - there are Caucasian brothers in Prince Hall lodges and Non-Caucasain brothers in regular lodges. We do not address homosexuality directly in our code, but we feel that our obligations would stop us from taking action against someone because of their sexuality - there are some very active and very well known homosexuals who are members. My Scottish Rite Valley has a very large number of People who practice Judaism. In that same valley, there are Muslims, Dieists, and Christians. I have difficulty understanding how other jurisdictions have the concerns that you have mentioned - I guess "your mileage my vary" but that isn't the freemasonry I know. The fraternity does not need to concern itself with anti-Mason's, the real enemy is disgruntled brethren and former brethren. The real enemy is not the disgruntled or former Brethren, it's the ignorant and the arrogant among us. That was a GM's ruling on religion, and it was over ruled by the Craft at the very next GL session. Furthermore, this part of our Articles of Incorporation was amended by an edict in 1993..It is mentioned in the above article just barely as the press always do. Now think about this. What does this have to do with this mans suspension from our Fraternity..Answer is nothing...It was done out of shear spite to try and force GL to reinstated him. 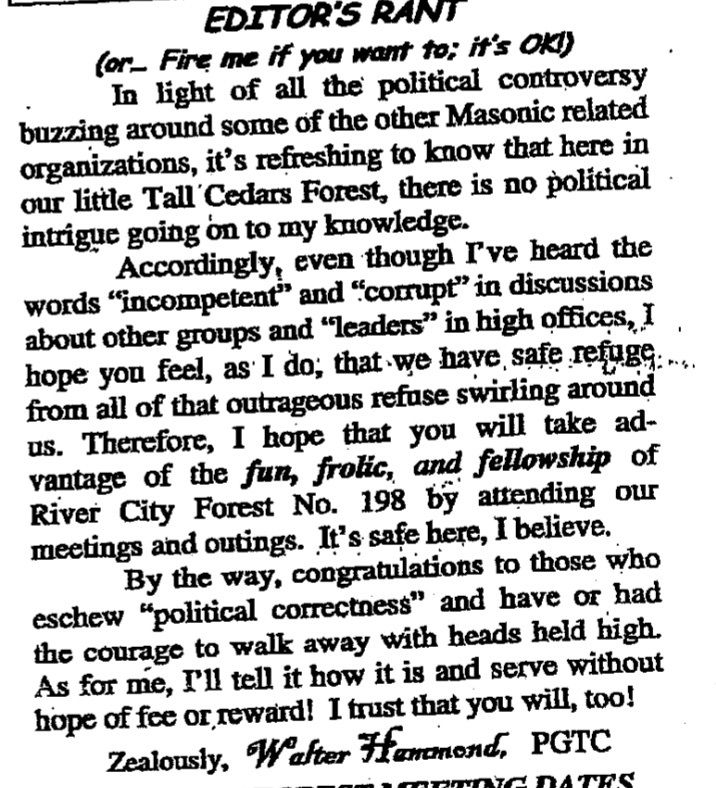 He was given a letter of good standing for the purpose of petitioning a lodge and all lodges rejected him , I'm sure, because of the baggage that comes with him. 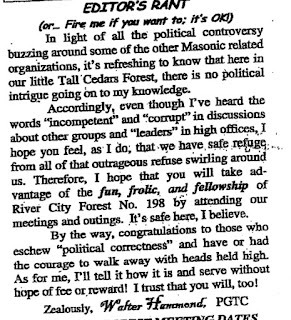 This is an older brother with fifty years of service to the fraternity who edited a local newsletter and like others was aware of problems in the grand lodge. After being tossed out for expressing an opinion, he has spent eight years asking to be reinstated and finally has resorted to law. To have been aware of the whites only clause but letting the decades go by without changing it, citing financial reasons, is in keeping with the refusal to change the exclusion of Jews from grand bodies, recognition of African dictators as grand masters, continued recognition of racist and gay bashing grand lodges - just more evidence of how we must clean house. if you read this brother's horror story, you realize how low, how slimy, some grand lodges have become. 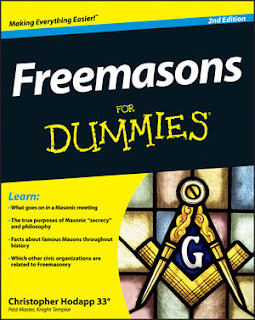 At least in the Grand Jurisdiction of Florida, the Digest of Masonic Law IS the Law. If a behavior, action, etc. is prohibited in the Digest, it IS prohibited, and any Mason violating such provision (racism, discrimination, etc) can be subject to charges. However, definitely not good press for the Grand Lodge of Florida. I would encourage the Masonic brethren to continue their support of each other and remain of good cheer. Sooner or later the present storms we are facing will past and the Craft will be the better for it. excellent job at her duties. Both Tennessee and Florida have the grand lodges threatening brethren about speaking their views, and snooping the internet for proof. I'm confused by the statement that they would need to dissolve the corporation to change the law. The Michigan Legislature has amended the act incorporating the Grand Lodge of Michigan and we are trying to get it amended again. I'm no attorney, but I too found it peculiar that there is no provision for amending the articles of incorporation beyond dissolving the whole thing and starting from scratch. There would be no reason to dissolve the corporation to accomplish this. Externally, any laws that allowed Articles of Incorporation to be filed specifying "white only", would have been superceded by subsequent legislation and court decisions that prohibited such things. Internally, an amendment to Article of Incorporation and any references in By Laws should be sufficient. This is no different essentially from many Homeowners Associations who used to exist around the country that were incorporated with such provisions. The passage of legislation banning such practices superceded any provisions in their original Articles, rendering such things null and void.